The Middle Georgia State Band of Knights Outdoor Performance Ensemble is one of the most exciting, dynamic, and visible organizations at Middle Georgia State University. 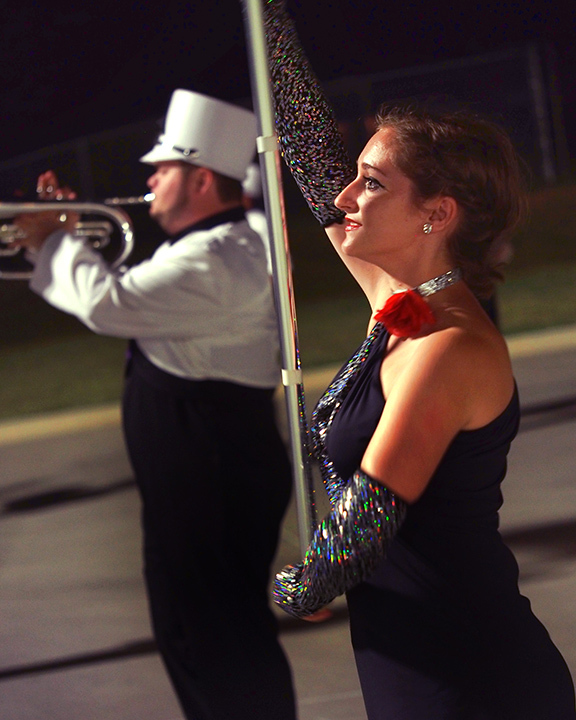 Comprising students from many different areas of study from Middle Georgia and across the state, the majority of Band of Knights members actually major in subject areas outside of music. Even though our members possess a wealth of musical talent, we particularly desire players who demonstrate a strong sense of dedication and pride in their work. 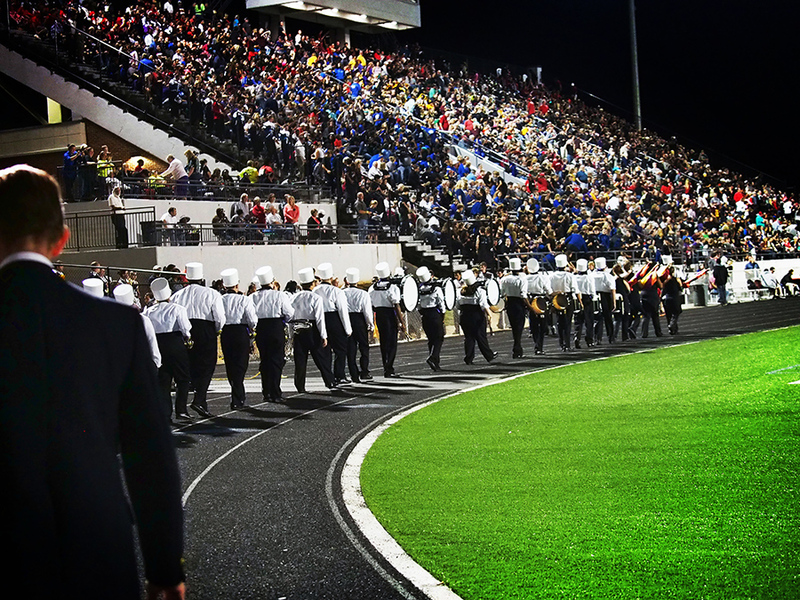 From the Band of Knights Marching Band to our outstanding jazz, percussion, and wind groups, instructional excellence is our top priority. Our goal is to meet both the performance objectives of our ensembles as well as providing a top-rate educational experience to our members. As the Band of Knights continues its tradition of making a difference, one student at a time, we invite you to join us! Expectatio Excellentiae Dedicatione. Go Knights! 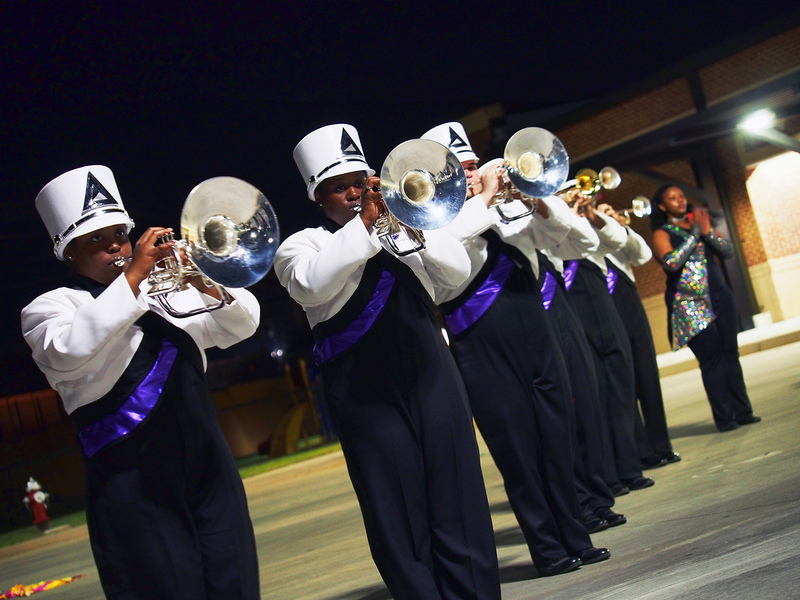 The Marching Band rehearses Tuesdays and Thursdays from 5:30 PM to 7:30 PM in our practice facilities on the Macon campus. We also rehearse on Saturday mornings of game weeks. Auditions for The Band of Knights begin in February and continue through the beginning of our preseason band camp which begins just prior to the start of fall semester classes. All students selected for membership in The Band of Knights Marching Band (including Colorguard and Drumline), must be registered in MUSC 1080 (2080 for returning members) for the fall semester. There are no fees required for membership and Middle Georgia State University pays for travel and uniform items (except band shoes.) All Band of Knights members order and buy the same black marching shoe. Ordering information is provided by the Band Department. The Band of Knights band camp will run the first weekend of fall semester after classes begin; August 16, 17, and 18 from 10:00 AM to 6:00 PM on Friday and Saturday, and 1:00 PM to 5:00 PM on Sunday. All rehearsals will be held in our practice facilities and on our practice field on the Macon campus. Camp will include Guard, Percussion, front ensemble/rhythm section, and Wind sectionals as well as full ensemble movement basics, music rehearsal, and setting drill. Be on time and be ready to roll…we have a lot to do! Percussionists please see our Drumline page. Woodwind and brass players audition for The Band of Knights by playing major scales, a prepared piece, and sight reading. Prepared music can be a solo, etude, or honor band audition material. You do not need a pianist. The entire audition takes approximately fifteen minutes and is fairly informal. Students not majoring in music can schedule an audition anytime between February 1st and August 14th. Music majors who are accepted into a Department of Music wind or percussion studio are automatically invited to our preseason Band Camp. Auditions may be waived at the discretion of the director and instructional staff. Please fill out the registration form on this web site to add your name to the mailing list. If you are an out-of-state student, and are unable to come to campus for an audition, we will accept a compact disc audio or DVD video of your playing. Once accepted to MGA, all incoming freshmen should schedule their orientation and testing prior to Band of Knights Preseason Band Camp. Please consult the Middle Georgia State web site for available dates for these sessions. Final selection of Band of Knights Marching Band members will occur during the Preseason Band Camp in August.